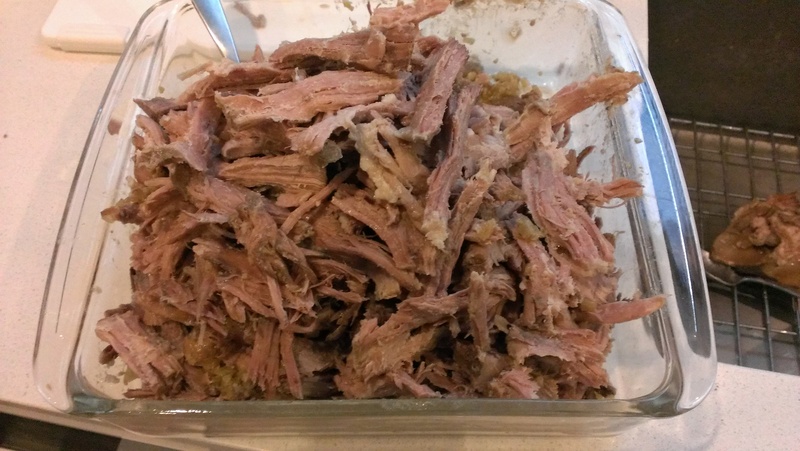 Last night we dined on some pulled pork shoulder that I made. 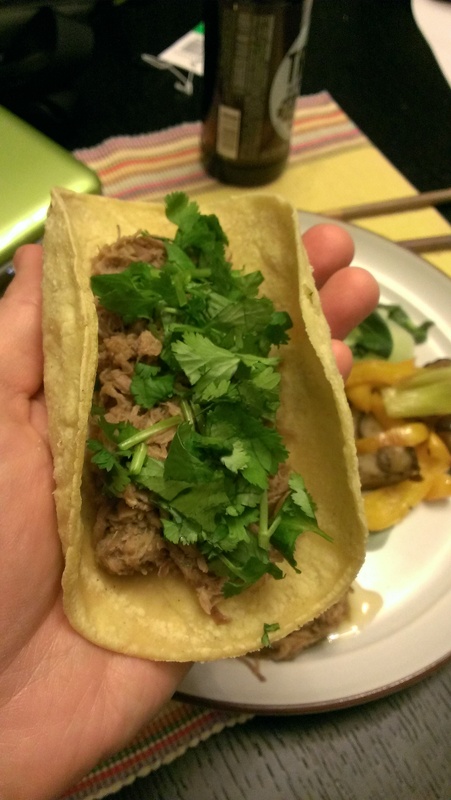 I wasn’t quite sure how I wanted to serve it, but when Yuki was on her way home from work she stopped to grab some tortillas and oiala, lemongrass carnitas were born…and devoured…and still getting devoured as there is a ton of it in our fridge. I started this dish off the day before since flavors develop over time on braised dishes. 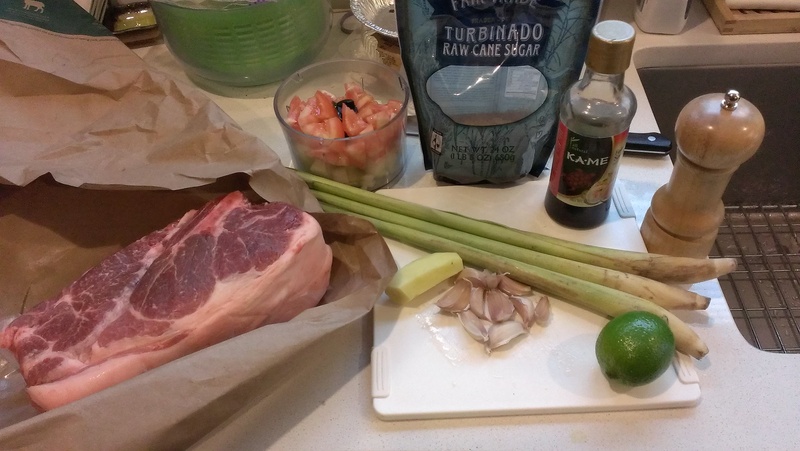 I picked up a 4.5 lb bone-in pork shoulder, diced a tomato and half onion (shown in my little mini food processor container), three stalks of lemongrass outer leaves removed and tender middle chopped up (I reserved the tougher top portions for the braising liquid), a 2 inch piece of ginger chopped, 10 cloves of garlic chopped, the juice of 1 lime, three good pinches of sugar, about 2 tablespoons of fish sauce, and 15 or so cracks of black pepper. Everything except for the pork went into my little food processor and I turned it into a wet rub. 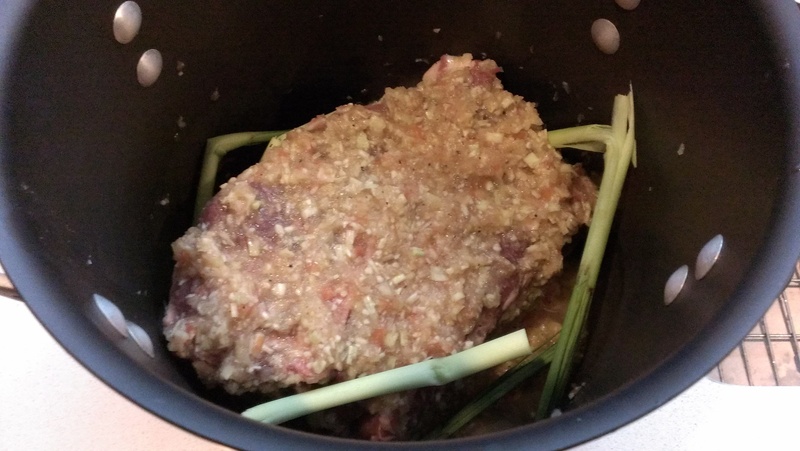 I covered the pork shoulder with my marinade and let it sit in my large pot with the reserved lemongrass stalks for about an hour to let the juice start to penetrate the meat. 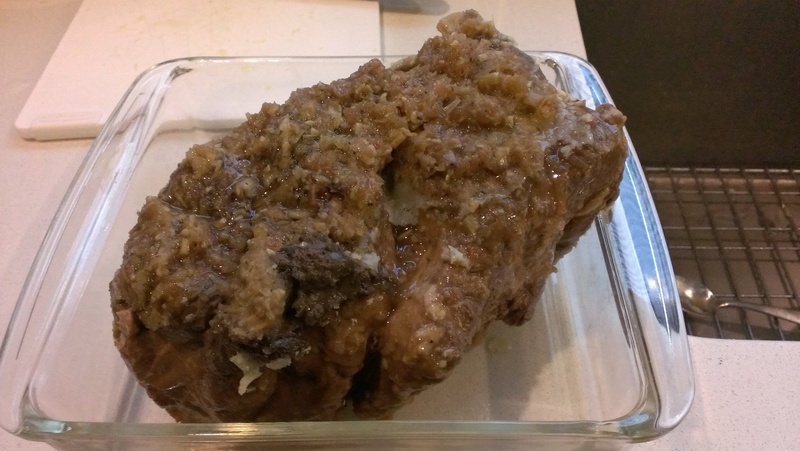 Then I poured in about 1/3 cup of soy sauce, 1/4 cup of cooking sake, and then filled it with water till the liquid covered about 3/4’s of the shoulder. I brought it up to a boil then covered the pot and turned the heat to low. I let it simmer for about 6 hours. After it was done simmering I let it cool down a bit and then put it in my fridge to sit overnight. Yesterday afternoon I took it out of the fridge, scooped up the thin layer of fat that hardened on the surface, and took the shoulder out. I pulled the pork apart. Best way to do that is to just get your hands dirty. Let’s be honest here, is there anything wrong with having your hands smell like lemongrass pork? I think not. 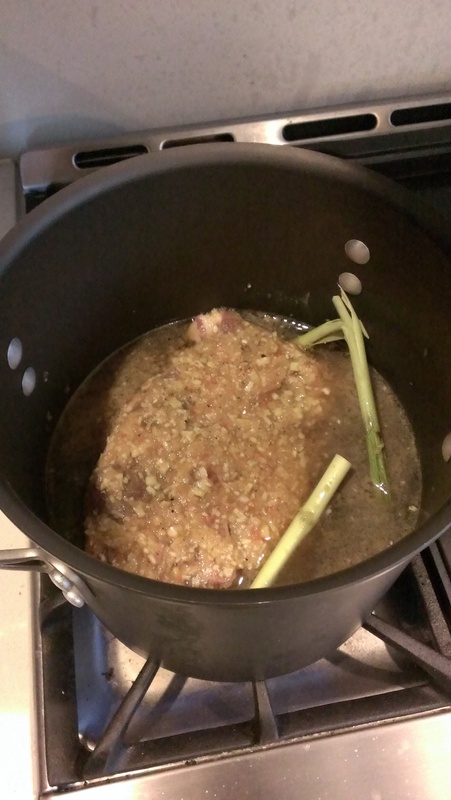 Speaking of lemongrass, I discarded the tough parts that were in the braise. 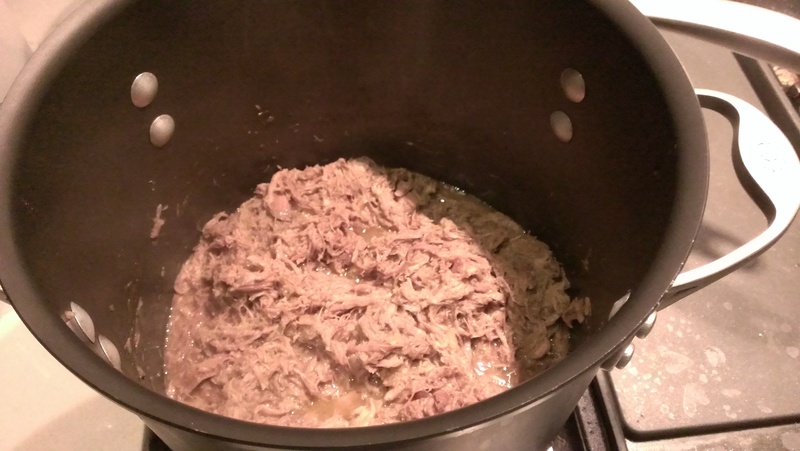 I put the pulled pork back into the pot with the braising liquid and brought it back up to a boil. 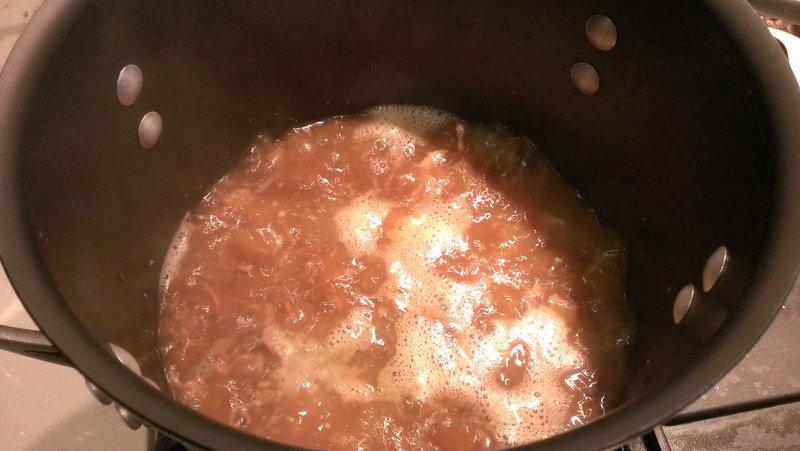 I let it boil down for about an hour to let a majority of the liquid evaporate. What you’re left with is a rich, flavorful heaping pile of swinealicious meat that drips down your hands as you slap it on a tortilla. Again, there’s nothing wrong with hands that smell like lemongrass pork. I served these carnitas with cilantro, white rice, steamed bok choy, and sautéed chinese eggplant, green onion, and yellow bell pepper. Avocado would’ve been pretty good with them too. Topping them with diced tomato and onion wouldn’t be bad either. thoughts on simmering/braising vs. slow cooking? Realy no difference if you’re doing it wet baby!